Inverness Bike Tours offers a cycling guided tour around Inverness. The tour shows you the River Ness, Ness Islands, Botanic Gardens (short stop), Caledonian Canal and Merkinch Nature Reserve. This tour lasts about 2 hours 15 minutes and covers 10 km of easy cycling on flat cycle paths, canal towpaths and some minor roads. 3 tours operate daily (10am, 1pm and 4pm) from March to October. Adults only (no children). Booking essential. Maximum 10 people per tour. Bikes and helmets provided. Tel: 07443 866619. Walk Inverness is operated by local lady Cath Findlay who offers guided walking tours on certain days departing from outside the VisitScotland Centre in the High Street. Mobile: 07923 491400. WOW Scotland (tel: 01808 511773) offers an Inverness Outlander walking tour on certain evenings 6pm - 8pm from April to October starting from the statue of Flora MacDonald at Inverness Castle. 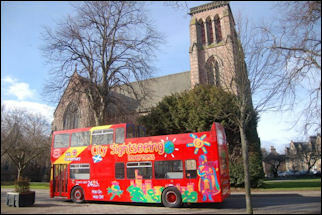 City Sightseeing Inverness has open-top red buses operating daily from 1 April to 29 September 2019. Tours start at the bus station (hourly from 9.30am to 3.30pm). Just buy your ticket on the bus (tickets are valid for 24 hours). Tel: 01463 712121. You can get the local bus timetables from the tourist office and make your own tour if you wish e.g. take the Citylink bus to Fort William and back, or go to Eilean Donan Castle and back in a day. Stagecoach Buses will take you to places such as Cawdor Castle, Nairn, Beauly and the Black Isle. See the bus timetable links and info on the Inverness Transport page. However there are lots of guided bus tours from Inverness (mainly during the summer), some in minibuses and some in full-size coaches. These are very good value and often combine places which aren't convenient to reach by public transport in a single day. You can virtually stay for a week in Inverness and go on a different tour each day! The best thing to do is just go into the tourist office early in the morning or the day before and ask what is available. Some are advertised on boards outside the tourist office where the tours will pick you up. Isle of Skye Tour (summer 11 hours / winter 8 hours), Loch Ness & Culloden Battlefield Tour (8 hours), Glenfinnan & Glencoe Tour (10 hours), Dunrobin Castle & GlenMorangie Tour (8 hours) , Speyside Whisky Tour (8 hours) - Glen Moray Distillery, Glen Grant Distillery, Aberlour Distillery Shop, Glenfarclas Distillery, Benromach Distillery. The Outlander Highlands Tour (8 hours) has a summer itinerary: Wardlaw Mausoleum, Clava Cairns, Culloden Battlefield, Tulloch Ghru, Highland Folk Museum, Ruthven Barracks or the winter itinerary: Wardlaw Mausoleum, Clava Cairns, Culloden Battlefield, Beauly Priory, Clootie Well, Loch Ness (with a view of Urquhart Castle). a guided coach tour from Inverness to the Isle of Skye including Loch Ness, Eilean Donan Castle, the Old Man of Storr, Kilt Rock, the Quiraing, the Cuillin and Faerie Glen. Available frequently from March to October. Orkney guided tour (departs from Inverness bus station at 5.30am, returns at 9.30pm). New for 2019 - selected dates in April, May and September. Will include ferry crossings, Italian Chapel, Kirkwall, Ring of Brodgar, Skara Brae and Stromness. Whisky Bus (departs from Inverness bus station every Monday and Friday from 1 April - 30 September 2019 at 0845, returns at 1845). This includes visits to Tomatin distillery, Glenlivet distillery, Glenfarclas distillery, Speyside Cooperage plus Macallan (Mondays only) or Aberlour (Fridays only) as well as travel through Highland and Speyside scenery. 34-seater coach. Tour Skye offers a 2-day trip from Inverness to Skye and back including Eilean Donan Castle, Cuillin mountains, the Old Man of Storr, Kilt Rock, the Quiraing and Uig. Another option is The Train to Skye - you can get the 08.55 train from Inverness that arrives in Kyle of Lochalsh at 11.30 where you are taken on a minibus tour of Skye lasting about 5.5 hours. They will get you back to the station in time for the 17.13 train to Inverness (arrives back at 20.00). Alternatively, you can also get a minibus day tour around Skye and then travel with them via Eilean Donan castle to Inverness for the continuation of your holiday. Tour Skye operates from April to October. Mercedes 16 seater minibus with free WiFi. Tel: 01478 613514 / 07931 352628. Facebook. Timberbush Tours offer several 1-day tours with a driver-guide: Isle of Skye & Eilean Donan Castle, Loch Ness, John o'Groats & the Far North (including Dunrobin Castle), Applecross & Loch Carron. They also offer a 3-day tour to Orkney (accommodation not included, but a booking service is offered if required). Highland Experience operate from Inverness bus station with these a choice of five different 1-days tours (April to October): Eilean Donan & Isle of Skye, John O�Groats and the Far North, Wester Ross and Applecross, Royal Deeside, Black Isle/Loch Ness and Moray Firth dolphins. They also have some 3-day tours available from Inverness to explore Orkney or the Hebrides. Rabbie�s Tours Of Scotland offers a wide selection of guided day tours from Inverness in a minibus with up to 16 passengers. Day tours include Loch Ness & Glen Affric, Isle of Skye, Speyside Whisky & Moray Firth, Cairngorms and Speyside, Black Isle, Torridon, Applecross and Eilean Donan Castle. There is also a 3-day tour to Orkney, and a 3-day trip to the Outer Hebrides, as well as a 3-day tour around the North Coast 500. This is a multi award-winning medium-sized company which is still family-run with specially selected tour guides. They also operate holidays starting from Edinburgh, Glasgow, London and Ireland. Highland Explorer Tours offer guided tours by midi-coach from Inverness. 1-day tour to the Isle of Skye and Eilean Donan Castle. 1-day tour to Loch Ness, Urquhart Castle, Beauly, whisky distillery, Culloden Battlefield and Clava Cairns. They also operate a 2-day tour to Loch Ness and Skye with one night's accommodation. Other tours operate from Edinburgh. VisitScotland 5 stars. Award-winning Loch Ness by Jacobite offer Loch Ness trips all year round. Departure points are from Tomnahurich Bridge (on Glenurquhart Road which is 1.5 miles south of Inverness centre - courtesy bus ride available via the open top City Sightseeing bus service in the summer months), Dochgarroch Lock (5 miles south of Inverness on the Caledonian Canal), or the Clansman Hotel Harbour (10 miles south of Inverness and 4 miles north of Drumnadrochit). All vessels have free WiFi. Scottish Tourist Board 5 Stars. Tel: 01463 233999. Full day coach tour from Inverness to Drumnadrochit (includes stops at Urquhart Castle, the Loch Ness Monster Exhibition Centre and the ancient Corrimony Cairns), plus a cruise on Loch Ness back to Inverness. Half day tours of Loch Ness including a cruise and visit to Urquhart Castle. Long or short cruises on Loch Ness. Day trip to Orkney: Visit all the main historical places of interest on Orkney with a tour by John O'Groats Ferries (Tel: 01955 611353). Every day from 1 June to 31 August 2019, the coach leaves Inverness Bus Station at 7.15am and returns at 9pm. Booking required. Alternatively stay in Kirkwall for 2 nights and go on the tour from there. This short break can be taken any day 1 June to 31 August 2019. For full details see the John O'Groats Ferries website. Shore Excursions offer half day and whole day sightseeing tours for small groups or families from the cruise liner port of Invergordon or from Inverness. Transport by car for up to 4 people or minibus for up to 8 people with local driver/guide. Destinations can include Inverewe Gardens, whisky distillery, Eilean Donan Castle, Dunrobin Castle, Loch Ness and Urquhart Castle. Contact Nigel Newell - tel: 01862 842260. Based in Inverness, Spirit Journeys Ltd is a travel agency/tour operator which can arrange tailor-made holidays (for individuals or groups), honeymoons, bespoke weddings or other special events. Half day and full day private tours of Scotland can be arranged (including themes such as wildlife, birdwatching, golf, culinary, whisky, archaeology, etc.). Outlander tours are available (from 1 to 10 days). With over 25 year�s experience, this company is registered with ATOL and the Travel Trust Association. Have your own private day trip customised especially for you. Some are operated by local taxi firms. Highland Tour Guide specialises in day tours from Inverness with themes such as Outlander, whisky distilleries, castles, clans, MacBeth, Brahan Seer and the Picts. Popular destinations include Loch Ness, Skye, Fort William. John is an experienced private tour guide (former college lecturer) with an air conditioned minivan with 7 seats. Shore excursions for cruise passengers can be arranged from Invergordon and Portree. Tel: 07719855621. Celia Ffitch-Stewart is a fully insured driver-guide with Mercedes limousine for your tailor-made guided tour. Collection from the train station or airport - or if you are on a cruise she can meet your ship at Invergordon. Half day, full day or extended tours. Meet your clan chief, trace your roots, stay in a castle, tour the whisky distilleries. Services can include itinerary planning and accommodation reservations. Member of HOSTGA (Highlands of Scotland Tour Guide Association). Diana Bertoldi is Italian with Scottish roots and offers half day, full day or multi-day tours from Inverness or Invergordon (cruise terminal) with this driver/guide for a maximum of 7 people. Tours can be tailor-made and include sacred sites, distilleries, castles, Pictish Trail, Outlander, shopping, etc. Specialised tour guide for HOSTGA (Highlands Of Scotland Tour Guides Association). Families with children welcome. Based at Loch Ness, The Hebridean Explorer offers private tours from Inverness to visit places such as Eilean Donan Castle, Isle of Skye, Wester Ross and Lochaber. Tours can be designed for 1 - 4 days and cover the main Hebridean Islands and the Highlands of Scotland. Maximum 8 passengers in an air conditioned Mercedes Traveliner. Contact John Macdonald who is a native of the Hebridean Island of Lewis and was raised in a Gaelic speaking family. Tel: 07943 863292 or 01456 450595. Highland Taxis offer a range of private sightseeing tours at a fixed price. Drivers can be in authentic Highland dress if required. People carriers and converted minibuses available for larger parties. Also available for airport pick ups, etc. Disabled facilities. They have an excellent reputation in Inverness. Tel: 01463 222222. Robert Laidlaw of Ness Tours is a private tour guide who can collect you from anywhere in the Highlands - from your hotel, cruise ship at Invergordon, railway station or airport. Popular tours include Highland scenery, whisky distilleries, castles, historic sites, Loch Ness, etc. Tours are tailor-made to suit your interests. Minimum duration of 3 hours from Inverness or 5 hours from Invergordon. Inverness Exclusive Tours offer 5-star quality private tours from Inverness by Tony Harmsworth - the expert on Loch Ness. Variety of tours (2 hours, half day, full day, 2 days) covering the Inverness area including castles, standing stones and historic sites. Longer tours can include the Oban and Isle of Mull, or John o'Groats and Orkney. Luxury Mercedes vehicle (max 7 passengers). Collection from hotel, station or airport. Highland Chauffeur Drive (based in Inverness) can offer guided tours or airport transfers in cars or a people carrier. Wedding car hire also available. J A Johnstone Chauffeur Drive is a husband and wife team based in Inverness. They offer a full range of chauffeur driven services by car or 6-7 seat people carrier for individuals or small groups. Customised tours (for a day or a month!). Over 20 years experience. Highly recommended. Member of the Highlands Of Scotland Tourist Board and the American Society of Travel Agents. Credit cards accepted. Tel: 01463 798372. Loch Ness Taxis & Tours has a fleet of vehicles including an 8 seater Traveliner. Available for airport transfers, bus & train bookings, and sightseeing tours around the Highlands. Contact Mark Williamson. Tel: 01463 239876 / 07876688453. If you are particularly interested in history, then ClansandCastles.com will take you on guided tours of castles with departures from Inverness including day trips such as Eilean Donan and Urquhart on Loch Ness, or Cawdor, Brodie and neighbouring castles to the east. Accommodation can be arranged if you would like a trip longer than a single day. Themed tours to follow in your clan footsteps available on request. Small groups in a car, minibus or a 50-seater coach can be catered for. Each of the Chatelaine's Guides live and work in the Highlands and are keen to share their local knowledge. Click here for full details on how to book your tour in advance. Dolphin Spirit is a new boat which can take 70 people from Inverness Marina to see the Bottlenose Dolphins in the Inner Moray Firth. Choice of four 90-minute cruises a day. Mob: 07544 800620. Phoenix Boat Trips operate from Nairn with wildlife cruises (1 hour or 2 hours) into the Inner Moray Firth. Contact Eric Wardlaw. Mobile: 07703 168097. From Cromarty, 30 minutes drive north of Inverness, EcoVentures offer trips in a high speed RIB to see bottlenose dolphins, seals, whales, etc. in the Cromarty Firth. Maximum 12 passengers. Bookings can be made through The Dolphin Centre at the Harbour Workshop, Victoria Place, Cromarty (by the harbour). Telephone 01381 600323. 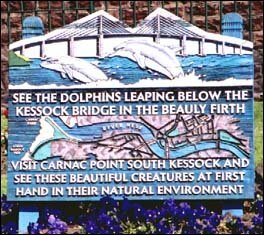 Dolphin Trips Avoch provide daily boat trips in the summer from Avoch harbour on the Black Isle. Telephone 01381 622383 or 07779 833951. There are a variety of dolphin trips on offer from various places along the Moray coast - click here for links (provided by the Dolphin Space Programme - which is a code of conduct for marine wildlife watching on the Moray Firth). Established in 1973, award-winning Jacobite (previously known as Jacobite Cruises) operates a variety of Loch Ness cruises all year round. Combined cruise and coach tour options depart from outside Inverness tourist office. Scottish Tourist Board 5 Stars. Online booking available. 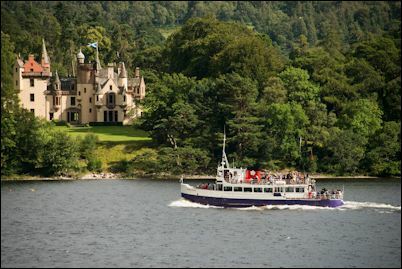 Boat trips on Loch Ness from Drumnadrochit and Fort Augustus - click here. Based in Inverness, Caley Cruisers have a fleet of 40 motor cruisers to choose from. You can charter one on a weekly basis or just for a short break for 2 to 8 people. Boat handling instruction is given and there's no need to have a boat driving licence. You can cruise Loch Ness and the Caledonian Canal. Fishing permits available. Loch Ness and Great Glen Cruise Company operates the Spirit of Loch Ness which offers 3 and 6 night cruises between Inverness and Fort William. West Highland Sailing (based at Laggan Locks) have a wide range of yachts and luxury motor cruisers for hire. The Caledonian Canal runs between Inverness and Fort William. Explore Highland offers canoe & kayak hire, courses and holidays. Based at the end of the Caledonian Canal in Inverness at the Clachnaharry Works Lock. See the outdoor activity operators list in The Internet Guide to Scotland for more companies in the area.